Coffee Mug Scroll Saw Pattern. Your a woodworker. Shouldn't you drink your coffee from a wooden cup? This is a fun project and it can be used for something useful. The cup is made up of four 3/4" rings, one 1/4" bottom and a handle. This project has two challenges. Sanding and finishing. After you cut the four rings you need to glue them together with waterproof glue. The more accurate you cut the rings the less sanding you will have to do. Do not glue on the bottom until after you sand all the rings flush. Drum sander, spindle sander, belt sander and hand sanding all have a place in getting this mug smooth. Take your time and sand it well. It will not look good if the rings are not smooth. When you finish sanding the rings glue on the bottom and sand it flush. To attach the handle you need to contour the points where the handle contacts the mug. Wrap sand paper around the mug and use that to sand the handle until it fits the contour of the mug. Glue the handle to the mug. Now we need to apply a finish that will protect the mug from the liquid and be food safe. This always ends up getting me some email telling me that the finish is not food safe. As I have said before there is tons of misinformation out there on which finishes are food safe. Almost all modern finishes are food safe after they have completely cured. Curing is longer than drying. Usually several days to cure. One finish that works well in a project like this is a two part epoxy resin. It's not easy to work with but once it cures it is waterproof and safe. Applying it without getting runs is difficult when there are inside and outside surfaces. 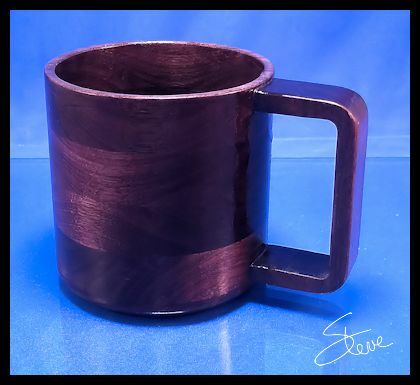 I used polyurethane on this mug. I will let it cure for a month before I actually use it but then I am totally confident that it is safe. I applied the poly with a foam brush. Do not over brush the finish. If you are not satisfied with the finish wet sand to the desired grit and apply more poly.